Starting from Munich, we travel on the highway until lake Starnberg. After a short glance upon the lake, we will enjoy one of the most picturesque landscapes in Bavaria with century-old farms and buildings while travelling to the small village of Hohenschwangau. From here, we take a carriage transfer to the "Marienbrücke" bridge, from where we have a splendid view over both Hohenschwangau and Neuschwanstein castles. 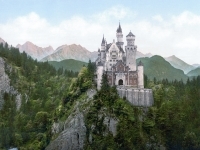 After a short pause, we will join an English speaking guided tour through Neuschwanstein castle before having lunch either in the Neuschwanstein castle restaurant or in a traditional bavarian restaurant in Hohenschwangau village. After lunch, we continue past lake Plansee (in Tyrol, Austria) towards Linderhof castle, which we also visit with an English speaking guided tour. Through the characteristic village of Oberammergau with its painted facades (short photo and shopping stop) and past the interesting Ettal abbey we drive back to Munich. Our sightseeing tours to Neuschwanstein and Linderhof castles can be adapted to your personal desires and requirements. For instance, it would be possible to include a guided tour through Hohenschwangau castle or Ettal abbey in our sightseeing tour program. And of course our Neuschwanstein sightseeing tours and Linderhof excursions can also be started from different locations than Munich, for example: sightseeing tours from Innsbruck. You are visiting the English section of the Munich Tours website. Below this text, you will find links to important technical information. On the outer right rim of the page, you may choose between different popular sightseeing excursions to Bavaria and Austria by car, minibus and coach. To get information in a different language than English please click on the respective country flag.